To slide means ‘to move smoothly and in contact with a slippery surface,’ ‘to pass smoothly,’ and ‘to move without being noticed.’ To fall gradually into a certain state is also to slide and, when you let something slide, it means that you allow it to proceed naturally without interfering. 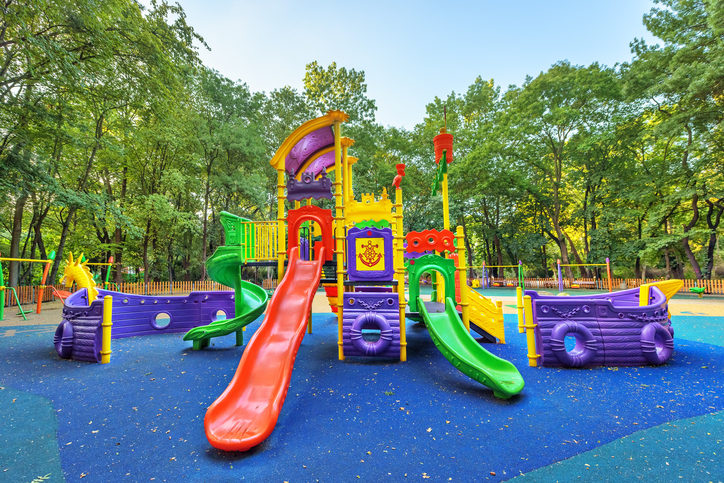 As a noun, a slide is the act of sliding and also a smooth surface for sliding, especially a kind of chute often found in children’s playgrounds. In photography, a slide is a small frame of film mounted on cardboard that you can project onto a screen. Mark slid out of the meeting early. When I'm busy with work, I always end up letting my household chores slide. The sled descended the hill in one fast slide. The children love playing on the slide. A lot of our old family photos are on slides. In baseball, players can slide into a base by literally trying to slide, feet first, under the baseman as he catches the ball. Slide dates back to before the year 950. The Old English verb slīdan, which became sliden in Middle English before losing the old verb ending, meant ‘to glide, slip or fall,’ and also had the figurative senses ‘fail, lapse morally, or err,’ and ‘be transitory or unstable.’ It can be traced back to the Proto-Germanic verb slidan (to slip or slide), from the Proto-Indo-European root sleidh– (to slip or slide). It is related to the Old High German slīto, the Middle Low German slīden, the Middle High German slīten, and the German Schlitten, all meaning sleigh or sled, as well as the English word sled. The meaning ‘to slip, or lose your footing’ appeared in the early 13th century, while the transitive sense is from the early 16th century. The phrase let something slide appears in the writings of Chaucer in the late 14th century, and later in Shakespere’s work as well. The noun comes from the verb, and (meaning ‘the action of sliding’) appeared in the mid-16th century. The meaning ‘a surface down which something can be slid’ is from the late 17th century, but playground slides did not exist until the late 19th century.